The Wednesday Chef cooks her heart out, finds her way home, and shares her recipes with usIt takes courage to turn your life upside down, especially when everyone is telling you how lucky you are. But sometimes what seems right can feel deeply wrong. 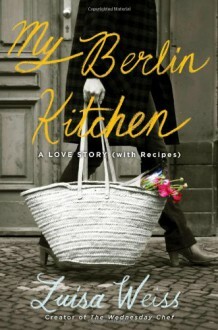 My Berlin Kitchen tells the story of how one thoroughly confused, kitchen-mad perfectionist broke off her engagement to a handsome New Yorker, quit her dream job, and found her way to a new life, a new man, and a new home in Berlin—one recipe at a time.Luisa Weiss grew up with a divided heart, shuttling back and forth between her father in Boston and her Italian mother in Berlin. She was always yearning for home—until she found a new home in the kitchen. Luisa started clipping recipes in college and was a cookbook editor in New York when she decided to bake, roast, and stew her way through her by then unwieldy collection over the course of one tumultuous year. The blog she wrote to document her adventures in (and out) of the kitchen, The Wednesday Chef, soon became a sensation. But she never stopped hankering for Berlin.Luisa will seduce you with her stories of foraging for plums in abandoned orchards, battling with white asparagus at the tail end of the season, orchestrating a three-family Thanksgiving in Berlin, and mending her broken heart with batches (and batches) of impossible German Christmas cookies. Fans of her award-winning blog will know the happy ending, but anyone who enjoyed Julie and Julia will laugh and cheer and cook alongside Luisa as she takes us into her heart and tells us how she gave up everything only to find love waiting where she least expected it.